Is there anything better than watching the rain while nestling on the couch with a large pile of blankets? Yes, there is. Watching the rain while sitting on the couch with a large pile of blankets and knowing that a large baking sheet full of cinnamon buns is about to be ready! For me, there probably is no other recipe which I associate as much with winter and cozy late afternoons as this one. The scent of cinnamon and sugar in the air, watching the fluffy yeast dough rise and awaiting eagerly to take a huge bite of the warm buns coming right out the oven definitely is my kind of a perfect Sunday. 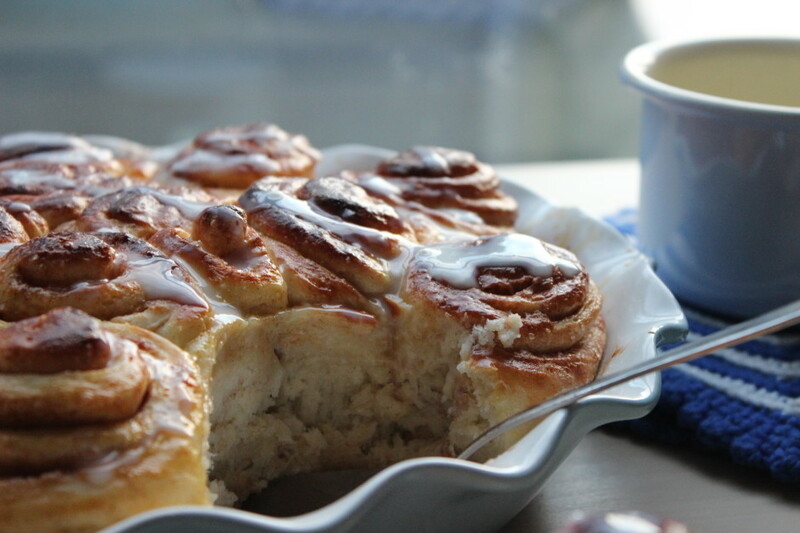 I sometimes, when no one is watching, even dream about whole towns built out of cinnamon buns – wouldn’t that be amazing? Driving in a cinnamon bun bus to a cinnamon bun university. Could be worse. This yeast dough recipe is just a basic one, not too sweet, which leaves so much room for experimentation. The filling is not too sugary either, as I prefer to get a little additional sweetness from the cream cheese frosting. I hope you’re having a relaxing, peaceful rest of the week! 2. Melt the butter in a saucepan and add the milk. 3. Pour the butter-milk mixture in the mixing bowl and add the egg. 4. With your hand mixer or food processor knead the dough until all the ingredients are well combined. If necessary, add a little more flour. Form a dough ball and let it rise at a warm place for about an hour or until it doubled its size. 5. Roll out dough into a rectangle about 0,5 cm thick. Then spread dough with melted butter and sprinkle evenly with sugar-cinnamon mix. 6. Roll it up lengthwise and cut in about 2 cm thick slices. Place the pieces into an ovenproof dish (make sure there is enough space between the rolls) and let it rise for another 20 mins. 7. Preheat oven to 200°C. 8. Brush rolls with egg yolk and bake them for about 15 mins until they’re golden brown. 9. I personally like to cover them with a light cream cheese frosting right after they come out of the oven so they’ll be extra moist. You just have to mix about 1 tbsp of cream cheese with some icing sugar and some fresh lemon juice. I’m totally new when it comes to baking bread. For those of you who stop by regularly, you may remember the promise to myself to start baking bread as soon as I will be back in Amsterdam because I discovered how easy it is. Well, this is just what has happened and now that I have settled in again, I am proud to announce that I only just made my second one. 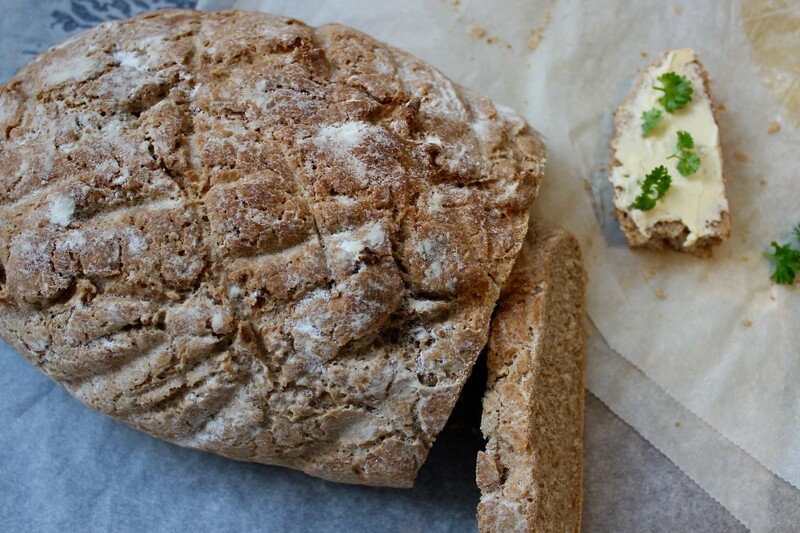 I felt that this whole grain buttermilk bread would be an appropriate start as it is so basic and offers many possibilities to add some special ingredients. Already looking forward to trying it out with chopped walnuts! I may have to work on its look for the next time, but the crust turned out amazing. Just make sure to place it on a cooling rack right after you get it out of the oven – otherwise it will get too moist from the outside. 1. In a pan warm up the buttermilk and dissolve the yeast until there are no small lumps anymore. 2. Add the buttermilk-yeast mixture to the flour, add salt and olive oil and knead the dough until it comes off the mixing bowl. 3. Now cover the bowl and, at a warm spot, let it rise for about an hour or until its size doubled. 4. Shortly knead the dough again, form a ball and place it on the baking tray. Let it rise for another half an hour. 5. In the meantime, preheat the oven to 200°C. 6. Cut an about 3 cm deep (otherwise it will look like mine and this is not what you want) cross into the dough ball and bake in the preheated oven for about 30 mins. 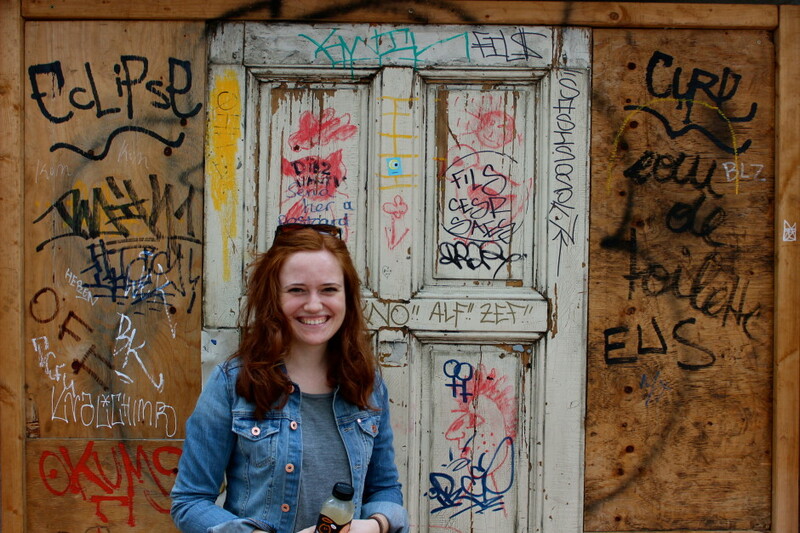 Then: knock, knock! When it sounds hollow, it’s done! Even though Amsterdam has been blessed with lots of sunshine and blue sky during the last few days (I hope this won’t change now that I’ve said it), I feel that days are becoming shorter again and fall is just around the corner. I have already stocked up my supply of teas and candles, but above all, I’m looking forward to the days when there’s no single reason to ever leave the house because it’s too cold and rainy outside. This simple recipe for a nourishing oatmeal is just perfect for days like these and given the context, I would highly recommend a breakfast in bed. 1. Warm coconut milk in a pan over low heat, then add both the oats and the coconut flakes and let everything simmer. 2. In the meanwhile, melt the butter in another pan, cut the fig(s) into slices and dredge them in the sugar. 3. Now, roast them until they’re golden brown on both sides. 4. In the meanwhile, the oats should be really smooth and ready to enjoy. 5. 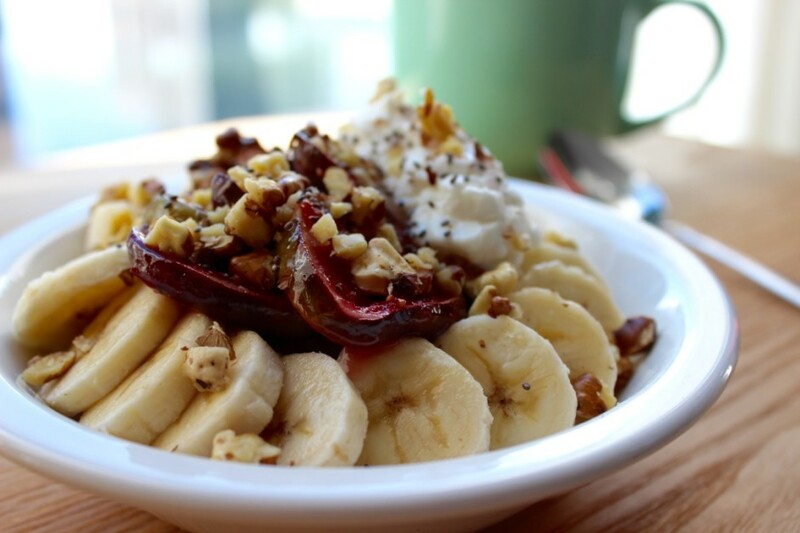 Pour oatmeal in a bowl and top with banana slices, figs and walnut. I also added some greek yoghurt with honey, which went really well with the oats and made it even more creamy. 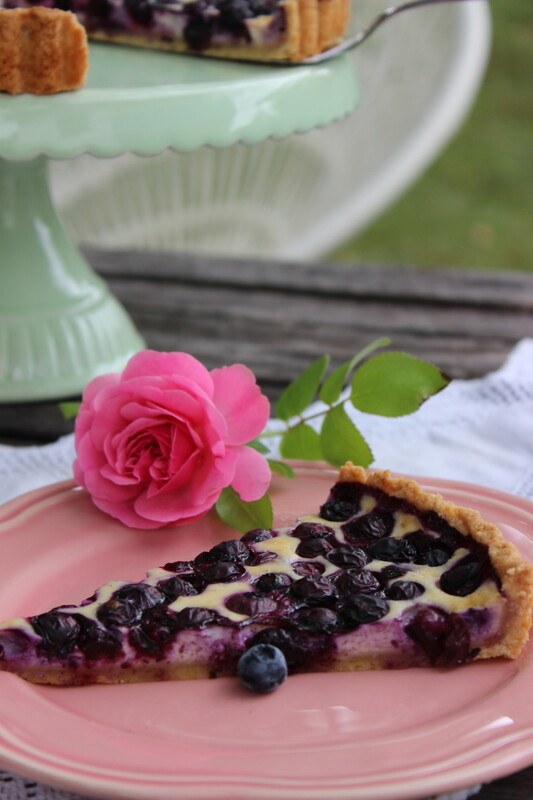 While my lovely friend and blogger in crime Hannah from Kuechenrebellin is enjoying Pizza, Pasta & Gelato in Italy, I had the chance to write a guest post and share a recipe for a blueberry tart on her blog. More than once, I have been invited for dinner at her place and I can witness what a great cook she is! If you’re into delicious but healthy cuisine, you should definitely make sure to stop by – it is worth it! For the blueberry tart recipe and more inspiration click here. While I wasn’t a big fan of cereals and similar up to a year or so, I now like the many possibilities these rather basic ingredients offer. I definitely appreciate the positive sides of a quick but still delicious and, most important, varied solution to hungry and busy Monday mornings where time to prepare a ‘real’ breakfast is almost always rare. These overnight oatmeal jars do not only look incredibly appealing, they are also perfect to prepare the night before, since they keep fresh in the fridge for at least three days. I used a basic recipe I adapted from ‘Green Kitchen Travels’, a wonderful book written by David and Luise, a couple currently living in Stockholm. Together with their daughter Elsa, they have travelled the world and brought home minds full of inspiration for new recipes, inspired by their experiences. There are endless variations to this basic recipe possible, I used a mix of mangos and raspberries this time, but I’m already looking forward to try it out with rhubarb. 1. 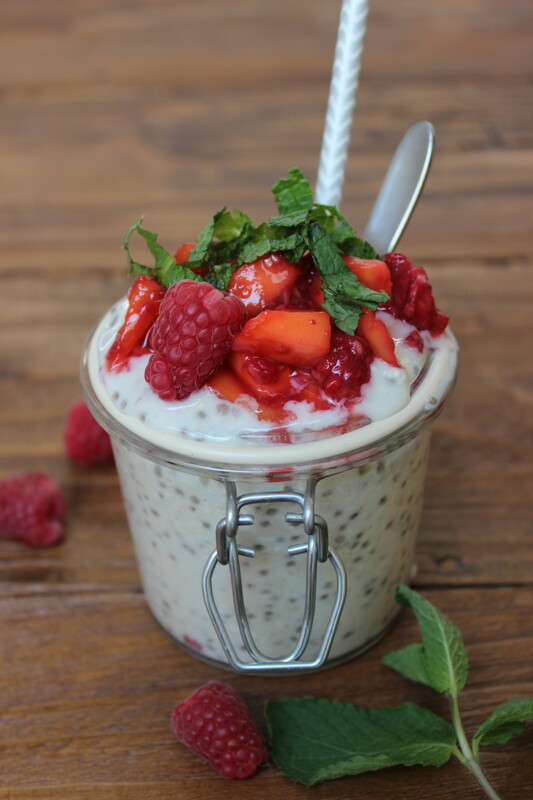 Fill the jar with rolled oats, chia seeds, almond milk and spices. Stir to mix and close the jar with a lid. 2. Let it rest in the fridge for a few hours or overnight. 3. Chop fruits and let simmer together with the agave syrup in a small pan. 4. Top the oatmeal pudding with stewed fruit and add finely chopped mint leaves on top.